My friend and I had some time before a matinee at Ford’s Theatre (the Lincoln-was-shot-here Ford’s Theatre) in DC, so we went in search of a place to have brunch. What we found was a place called Co Co Sala (www.cocosala.com), that describes itself as a “chocolate lounge.” We didn’t know that when we went in – we only knew that they were serving brunch and it’s less than a block from Fords – but I should have known that my inner GPS would steer me to wherever the chocolate is. Most of their dishes incorporate cocoa, including the entrees. 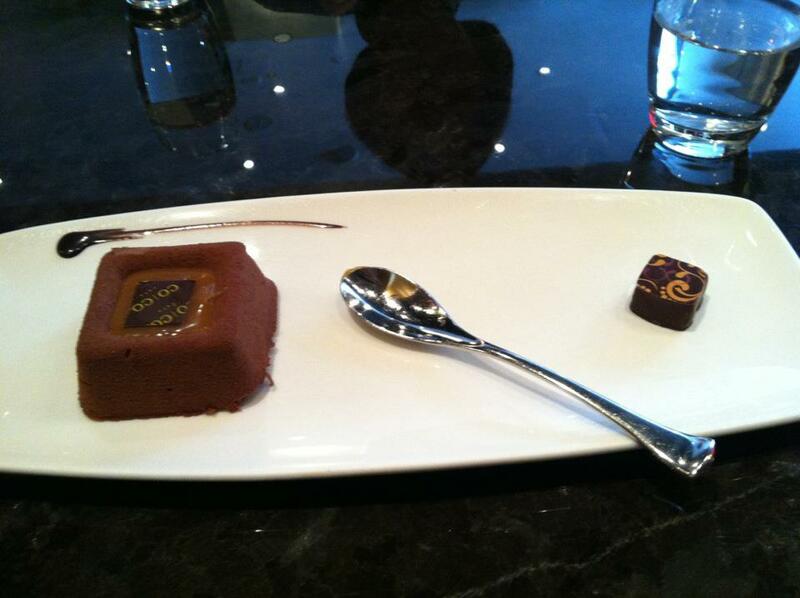 The restaurant started us with an amuse that looked and tasted like a little ball of dark chocolate heaven. We both ended with a desert called “Onyx” (pictured above, in the second before she inhaled it), a chocolate mousse-like concoction (there are non-chocolate options available). In between, she had a cheese enchilada and I had a cheese soufflé that was intensely cheesy while being incredibly light. We got back to Ford’s in time for a quick look through the museum before curtain. Gallery | This entry was posted in Uncategorized and tagged Co Co Sala, DC restaurant, Ford's Theatre. Bookmark the permalink. Didn’t you go to another chocolatey place a while back? A chocolate lounge would be one place I would definitely avoid! And for brunch? oh, feeling ill thinking about it 😀 My idea of a decent brunch is eggs florentine or left over curry at home. This is the same place and the same write-up. I don’t know why it came up as a new post when I transfered it, but it did. Well, I’m glad it came up as a new post, as I missed it the first time. That looks very decadent – and I really want to visit Ford’s Theater.